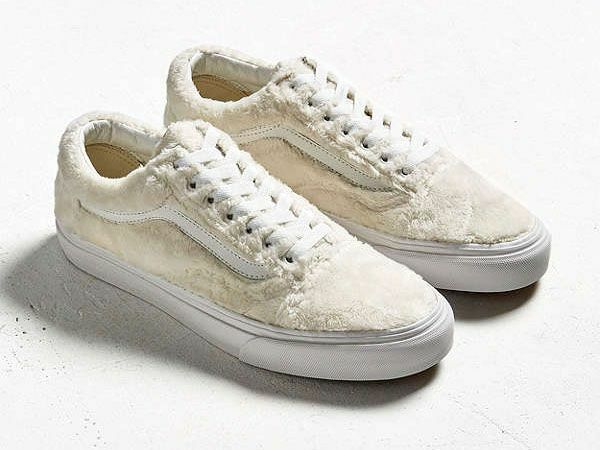 Vans's most popular sneakers just got a cozy, cuddly makeover, with three of the brand's best-selling styles—the Old Skool, Sk8-Hi, and the classic Slip-On—now available in an allover faux-sherpa exterior. The top-selling Vans silhouette—the Old Skool—comes in an ivory shade, while the Sk8-Hi is blanketed in gray sherpa fleece, with both styles still featuring the brand's iconic side-stripe accent. The Slip-On version also maintains the same classic look, with black-and-white checked fleece replacing the checkerboard canvas material. They still have the skater vibe but with a winter-approved edge. And with temperatures dropping, these new styles couldn't have been released at a better time. Plus, cool kicks (especially Vans) and faux fur are having a major moment right now, so what better way to rock two trends than with these cozy, winter-ready sneakers? We'll have one of each, please! Scroll down to see and shop the three Vans styles, updated with cozy sherpa. Next up, shop the sunglasses seen on both Selena Gomez and Karlie Kloss.